The first alleged attacker to be arrested, Miguel “Timido” Angel Lopez-Abrego, 19, was charged with first-degree murder and held in jail after a brief hearing Wednesday. I’m just keeping you posted on the wages of open borders so that you can plan appropriately. The M4 carbine is used by the U.S. military and by Border Patrol agents. It’s even used by the Border Patrol’s tactical unit, BORTAC. Agent Brian Terry was carrying the M4 when he was shot and killed in December 2010. Del Cueto tells us that because some of those M4s have not been replaced, agents are pooling their weapons, which makes it difficult to personalize the settings on a rifle, such as the sights. “The problem is they are now pool guns so what happens is instead of having their individual ones they have sighted in they’re having to use a pool weapon that you don’t know who used it before you,” del Cueto said. Prather believes removing some of the rifles maybe politically motivated. He says he was told that many of these guns are being removed for issues that are easily repaired like the firing pin and bolt. He broke down a M4 as he spoke. “This weapon is designed to be able to be in a battle situation, changed out rather quickly even so fast that modern weapons have areas to hold spare bolts,” he said. That makes him suspicious that the agency could be disarming its agents. The U.S. government has enough surplus weapons that every local yokel Sheriff’s department gets machine guns and armored vehicles on your tax dollars. But the Border Patrol agents are getting their rifles confiscated by the Border Patrol. It sort of makes you think that the administration is trying to cause an invasion, no? So it’s worse that sending weapons South of the border to criminal cartels in an attempt to shore up the case for a demand letter to FFLs. Now we want to ensure that agents who want to stop the criminals aren’t armed. There’s your administration and your tax dollars at work. The Texas Border Coalition recently issued its report entitled Without Strategy: America’s Border Security Blunders Facilitate and Empower Mexico’s Drug Cartels. The report makes some interesting observations, albeit sprinkled with odd and out-of-place assertions that have nothing whatsoever to do with border security. But the basic conclusions fall short of crafting the grand strategy they seek. Portions of the report are reproduced below (with running commentary). The United States government spent about $90 billion over the past decade to secure the U.S.-Mexico border. The results are mixed, with apprehension rates up to 90 percent for undocumented persons seeking to cross the frontier between designated U.S.-Mexico border crossings, yet the Mexican drug cartels continue to enjoy commercial success smuggling more drugs than ever into the country through the legal border crossings. The military forces deployed to the border don’t “include” National Guard, it is comprised entirely by National Guard. And as we have discussed before, the National Guard isn’t doing what the public thinks they are doing. The National Guard has been “deployed” to the border to perform clerical functions and do overwatch and reporting. The report does well to point out the high cost of deployment of these troops considering the very little that they have accomplished. Returning to the report. As the U.S. spent $90 billion seeking to secure the Southwest border, the Mexican cartels have continued to smuggle cocaine, heroin, and methamphetamine through the legal border crossings in California and South Texas, and marijuana between border crossings in remote areas of Arizona. They generally smuggle smaller loads of cocaine, heroin, and methamphetamine in non-commercial vehicles (cars, SUVs, and pickup trucks) to blend in with cross-border traffic. 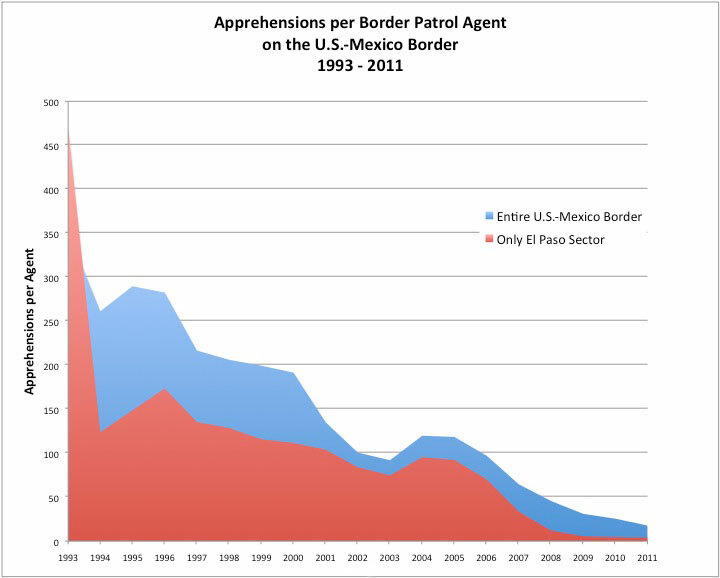 As the Mexican drug cartels flourish in the face of $90 billion spent to secure the border through which they conduct their trade, the U.S. continues to focus on border security tactics grounded in operation that began in the 1990s when an anti-immigration backlash fueled crackdowns code-named “Operation Gatekeeper” and “Operation Hold-the-Line.” Debates in Congress focus on building more fences and walls and whether to snuff environmental protections for public lands on the Southwest and Northern borders. As reported by the Department of Defense and the Government Accountability Office, America’s border security effort lacks strategic direction and operates on an ad hoc basis. Without a strategy, America will continue to lose the border security war to the better financed, equipped, more mobile and agile drug cartels. Our national success depends on defining and executing a strategy to defeat the cartels attacking our nation. The legal border crossings on the U.S. southwestern border have become America’s weakest border security link. Since the cartels choose to smuggle most of their products through the border crossings, a sensible strategy would be to attack their trade where it occurs and anticipate where their smuggling operations might move in response. Yet, the Department of Homeland Security has chosen to ignore these developments and refused to develop a strategy to confront them. Budget forecasts by Department of Homeland Security officials suggest no new funding for border security infrastructure at the official border crossings for many years and personnel accounts will essentially remain static during that time. While new equipment may become available, some cannot be utilized because the electrical facilities at the border crossings are outdated and inadequate to support the expensive new tools. Congress and the Administration confront a choice when considering strategic directions for securing the U.S-Mexican border. At a minimum, the Texas Border Coalition recommends that Congress and the President have a strategy rather than addressing this challenge ad hoc. crossings, where criminals face a 90 percent likelihood of apprehension, or addressing the inadequate infrastructure, technology and law enforcement personnel at the southwest border crossings where criminals are less challenged by an apprehension rate of merely 28 percent. The Texas Border Coalition suggests that the only reasonable path forward is to refocus our border security priorities where our nation is most vulnerable: at the legal border crossings. Spending additional billions of dollars on more Border Patrol agents, fencing-walls or exempting the Border Patrol from the rule of law should be lower priorities compared to making the official border crossings functional in securing our borders. To choose the other path and continue to fight the border security war where it has been won (between the border crossings) and to continue to surrender the war where we are losing (at the border crossings) is to threaten our national and border security and resign our nation to defeat. This document is focused on the security aspects of border strategy, especially as they related to Mexican drug cartels. There are additional benefits to improving the security at America’s border crossings, including facilitation of legitimate trade and travel with Mexico, providing a major benefit to the American economy and jobs. U.S. manufacturers and consumers depend on ready access to Mexican markets and goods. U.S. exporters serve the Mexican market and profit from foreign sales. Border region businesses in Arizona, California, New Mexico, and Texas tie their livelihoods to trade and create jobs for American workers. Mexico is America’s third largest trading partner behind only Canada and China. U.S.-Mexico trade totals $400 billion, a nearly fivefold increase since the enactment of the North American Free Trade Agreement (NAFTA), with most goods crossing via commercial truck. More than 13,000 trucks bring over $630 million worth of goods into the U.S. from Mexico every day. U.S. exports to Mexico total $163 billion. As a matter of general strategy, America cannot solve our budgetary problems solely by cutting expenses. We must increase our revenues. Making our border crossings more efficient in conducting legal trade with both Canada and Mexico will increase our national revenues and give us the resources to fight the other problems we face in our borders. Take careful note of the trade imbalance. The report has turned the horrible loss to our economy into a supposed boon if we control the legal border crossings better than we currently do. But a trade imbalance as large as this isn’t good for the economy. Further facilitating this trade imbalance may be the raison d’être for the grand strategy they recommend, but it falls far short of being a compelling reason to implement any of their recommendations. Also, the report seems to downplay the very real problem of border insecurity at locations other than official border crossings. But the Arizona ranchers might not be so impressed by the coalition’s claim that the border war has been won except for the crossings. There is still a very real problem, and any diminution of that problem of late has only to do with an ailing American economy rather than any success by U.S. law enforcement. Finally, to state flatly that “America cannot solve our budgetary problems solely by cutting expenses. We must increase our revenues,” is out of place and irrelevant. It is a value judgment rather than a statement of fact. It detracts from the supposed seriousness of the report. However, the coalition’s focus on the official border crossings does have merit, and the crossings played a role in our own previous recommendations. Searching every vehicle that crosses the border checkpoints. Increased sting and undercover operations by law enforcement to root out corruption. Sending the U.S. Marines to the border to (a) construct and occupy combat outposts and observations posts, (b) conduct regular foot patrols of the border, and (c) be allowed (by the U.S.) to cross the border if necessary to chase Mexican insurgents. Taking Congressional action to remove legal requirements such as the SCOTUS decision in Tennessee v. Garner, thus allowing the Marines to conduct combat operations at the border rather than law enforcement operations. U.S. Special Operations Forces raids against Mexican cartel high value targets inside of Mexico (with or without the permission of the Mexican government, unilaterally, and without Mexican involvement). The coalition’s report has made the mistake of making this an “either-or” choice rather than what it needs to be, “both-and.” While we’re engaging in debates about grand strategy, it’s important to note the state of affairs at the border again. A federal grand jury in Laredo, TX, convicted a Zetas-linked “hitman” on a raft of conspiracy, racketeering and weapons charges on Jan. 25, after hearing testimony that outlined activities of the gang’s vicious assassination cells on both sides of the southern border. Gerardo Castillo-Chavez, also called “Cachetes,” a native of Tamaulipas, Mexico, was convicted on all the counts against him, including conspiracy to possess with intent to distribute controlled substances, interstate travel in aid of racketeering (ITAR), and possession of a firearm in furtherance of a drug trafficking crime or a crime of violence. Castillo-Chavez’ trial began on Jan. 17 with jury selection and the verdicts were reached after four-and-a-half days of trial testimony and six hours of deliberation, said the FBI in a Jan. 25 statement. Castillo-Chavez and 33 others were charged in Feb. 2010 with 47 counts of conspiracy to kidnap and murder U.S. citizens in a foreign country, drug conspiracy, kidnapping conspiracy, firearms conspiracy, money laundering conspiracy, use of juveniles to commit a violent crime, accessory after the fact, solicitation, as well as substantive money laundering, drug trafficking, and ITAR charges. As to tactics, “Witnesses, including a federal informant and former Zetas operatives, offered a dramatic and sometimes gruesome peek into the inner workings of the cartel’s drug-smuggling operations in Mexico and the U.S. Among the most grisly testimony: new cartel recruits were trained to kill at a camp near the small Mexican town of San Fernando, where the remains of 200 bodies were unearthed last year. In all, 34 killers (in this one instance) were released to the U.S. to conduct operations on the U.S. side of the border. This is a stark reminder that there is little time left. So let’s divorce ourselves from the hotly contested issue of the so-called war on drugs for a moment. A number of things jump out about this report. First of all, the administration certainly isn’t serious about combating illegal immigration, any more than was the previous administration. Second, while The Fix might be concerned about issues associated with illicit drugs, I’m not. I am more concerned about the criminal insurgency and warlord-ism of the cartels (which only temporally uses drugs, and would and does use anything else to increase their power, such as human trafficking, kidnapping, extortion, gang violence and brutality, and so on). But even more to the point, we are losing the war at the border. We will lose the war at the border until we cease and desist treating it as a law enforcement endeavor, change the rules for the use of force (away from the SCOTUS decision in Tennessee versus Garner), and deploy the U.S. Marines to the border. The National Guard isn’t the answer. I have dealt with this many times before, considering whether training has been done, arming orders have been issued, and weapons and ammunition have been checked out of the armory. But the National Guard isn’t doing anything at all to effect border security. While I loath every word that comes out of the mouth of this president and cannot stand to listen to him, and would in fact blame the fire ants in my back yard on his administration if I could get away with it, removal of the National Guard from the border (as he has ordered) has nothing to do with anything. We have a larger, societal problem. We aren’t ready to fight the war at the border any more than we were or are ready to fight the campaign in Afghanistan.